Hello and happy last day of November! If I wasn’t already in the holiday spirit, something about the beginning of December always helps push me over the edge and makes me want to listen to Christmas music non-stop and bake all the Christmas cookies! If you have any tried-and-true gingerbread cookie recipes, please let me know because I promised Chase we’d make some together this holiday season. I have a feeling this weekend will be a pretty festive one because we’re heading to Great Wolf Lodge for a staycation as part of their local media weekend. Rumor has it the lodge is outfitted for the holidays and I cannot wait to check it out! I actually spoke with a mom at the airport last week whose oldest son was wearing a Great Wolf Lodge backpack and she had the best things to say about their visit which made me all the more excited to swim, play and explore! 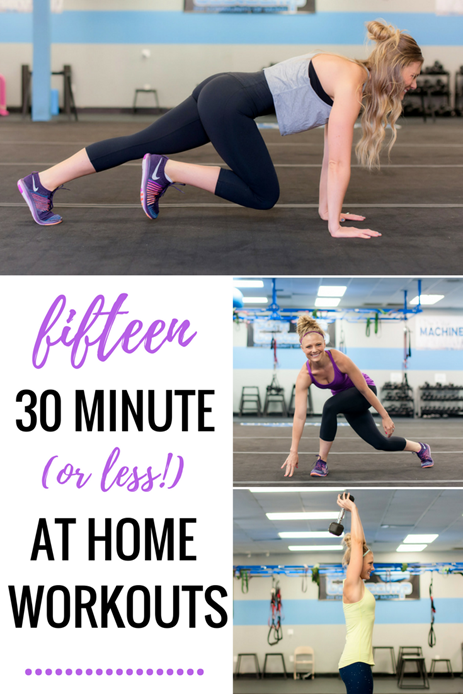 I’ll be sure to recap our weekend adventures on the blog on Monday but until then, let’s dive right into the usual Friday roundup of favorites, shall we? Please feel free to share a little bit about something that is making you smile this week, too! Over Thanksgiving weekend, I took advantage of some of the holiday sales and ordered a few things for our living room. We’re in the process of sprucing the room up a bit (we just had it painted earlier this week!) and it’s slowly coming together. I’ll definitely share before/after pics when it’s done but right now the latest addition to the room deserves a highlight here because I am in love with it! 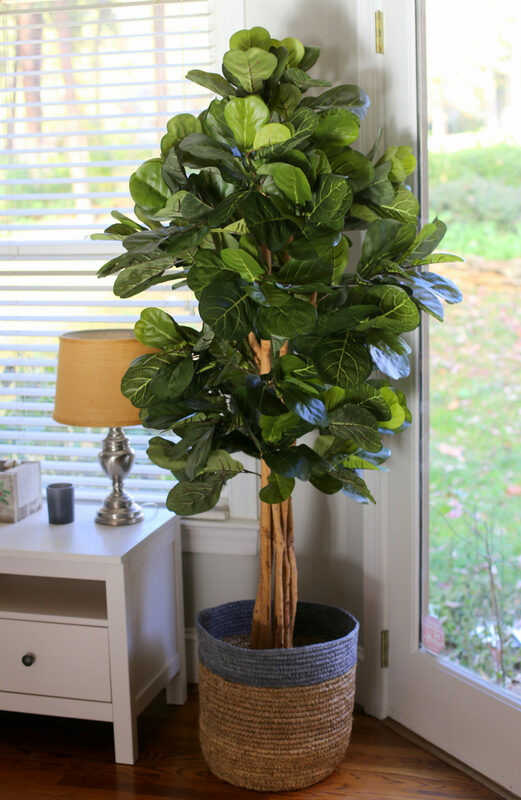 Our new faux fiddle leaf fig tree! I ordered the tree after consulting with a friend who had the exact same one in her family room. I knew I loved it and that it looked pretty darn real so I hoped it would look good in our living room, too. Since I had no ambitions to try to keep a real tree alive in our home, I ordered the faux tree (the 72” one) and after fluffing the leaves out a bit, it came to life and looks awesome. I put the tree in a seagrass basket I also ordered from Wayfair and it’s just what I was looking for in that space! Growing up, my sister and I amassed a bit of a collection of Christmas books that my parents would put up in the attic with all of our Christmas decorations after the holiday season was over. I absolutely loved reading my favorite holiday stories year after year and am hoping Chase and Ryder will feel the same way. After Chase was born, we began slowing adding to our family’s Christmas book collection and Chase lights up whenever we ask him if he wants to read one of his special Christmas books. If you happen to have a child in your life who loves reading holiday books, I highly recommend The Sweet Smell of Christmas. It was one of my favorites as a kid and Chase is very into it this year thanks to the scratch-and-sniff scents and the bears on every page. My Aunt Laurie came to visit for the day yesterday since her travels had her passing through the Charlotte area and it was so much fun to have her in town! (She’s the mastermind behind our family’s favorite shrimp dip. <– Keep that one on had if you need an appetizer to bring to a party this holiday season.) 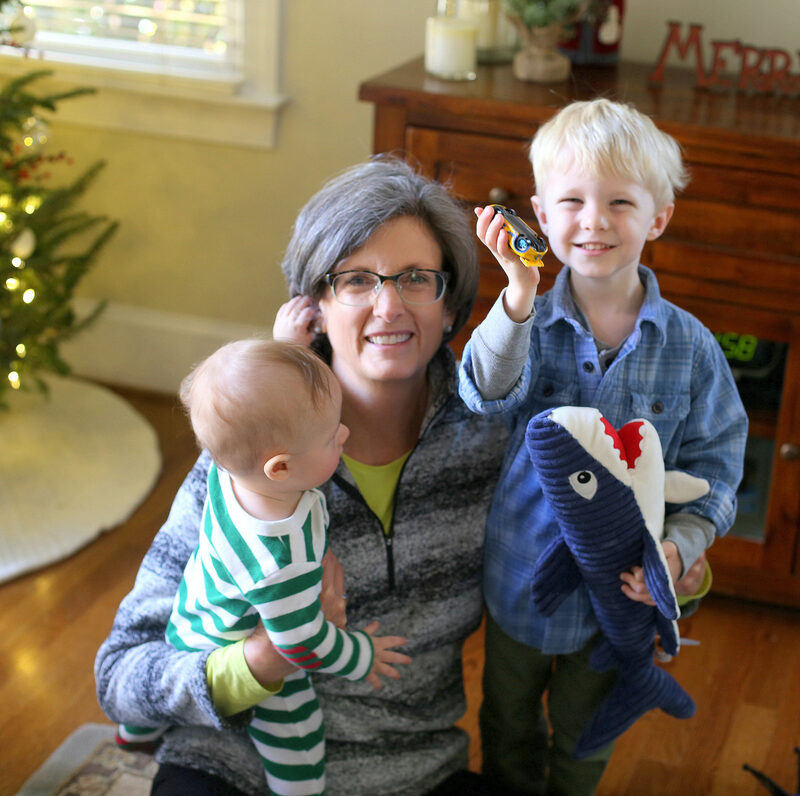 We call my Aunt Laurie the baby whisperer in our family for a reason because she is just one of those people with an innate understanding of babies and children. She always seems to know just what to do to calm babies and make a toddler’s day. Ryder was in heaven in her arms and after I picked Chase up from preschool, he couldn’t wait to play with Aunt LaLa and was all too excited when she greeted him with a new shark toy and a homemade shark fleece blanket. Chase turned the blanket into a car race track and I just loved seeing the boys with their great aunt. Thanks so much popping in for a visit, Aunt Laurie! A blog reader sent me a message about this account on Instagram and thought I would love it and she was absolutely right! I am always on the lookout for great book recommendations and this account is a great one because it offers a short summary of the book, a brief review and some quirky anecdotes to go along with it. I’ve read a handful of the books featured on this page (it’s a very new account) and so far I agree with their reviews which bodes well for future book finds based on their recommendations. What is one thing that is making you smile today? We just read The Sweet Smell of Christmas last night! We always laugh that the father and son bear wait until Christmas Eve to get their tree 🙂 We have had our copy for a few years so the scratch and sniff stickers don’t smell anymore but we still love it! Have a great weekend! Haha!! Same here! I mean ours was up the minute we got home from Thanksgiving wknd! Not related at all but this for some reason reminded me of a Berenstain Bears book where Mama Bear is pregnant & Papa Bear & Brother Bear go off into the woods to make Brother Bear a new bed and come home to find Mama Bear holding a new baby. Riiiiiight. 🙂 Oh and my version of The Sweet Smell of Christmas at my parents’ place definitely doesn’t smell anymore — I bought an updated one last year so this one is still fresh… but prob not for long! Thank you!! I’ve made a couple of her recipes in the past and you’re right — they’re always a hit! Making me smile this week: toddler and baby matching pjs, getting our Christmas cards from Minted and addressing/putting stamps on them. I hand write them and love it…I’ll never stop self-adressing my Christmas cards!!! 🙂 Also, morning coffee in my holiday mugs (as a teacher I have pleeenty of them!) And last but not least, I love that we have at least one holiday themed event every weekend until the end of the month. I love the Christmas book tradition idea – I can’t wait to start that with my daughter! Any other good Christmas books that I should add to our collection I am struggling a little bit to find some good ones! Yay for awesome aunts! I loved All the Light We Cannot See, one of my favorite reads of the last few years. The author is fantastic and one of my favorites! Agree — that book was incredible! Yes! My sister and I loved the sweet smells of Christmas and I now read it to my class a few times every Holiday season (we read it yesterday!) I always get nostalgic remembering each page from when we were little. My class loves it too 🙂 merry Christmas Little Critter is a good one too. The fact it’s Friday is making me smile…I can’t wait to sleep a bit! Tired teacher season with conferences, holiday show and whole school production make for a crazy busy month. Life… Life is making me smile… and cry, and laugh. All the emotions, but life is good. It’s been a tough year, but in the end there is so much to be thankful for and smile about. Also Mr. Willowby’s Christmas Tree is my favorite children’s Christmas book. I love that I’ll be able to share it with my toddler this year! 100% recommend it! 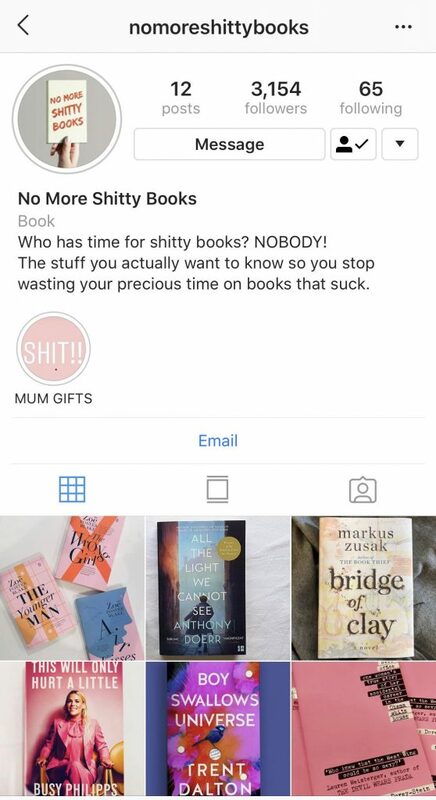 I run a similar book instagram, Book0Saurus, where I review book as well. I’m always looking for new ideas so I’m super excited to follow @nomoreshittybooks! One thing making me smile this week is the fact that I unexpectedly got to work from home today! Woohoo! My boss texted me as I was driving to work to let me know systems were down in the building, so I turned around and now I’m on my couch in my sweatpants snuggling with my cat watching Hallmark movies while I work. YAY! 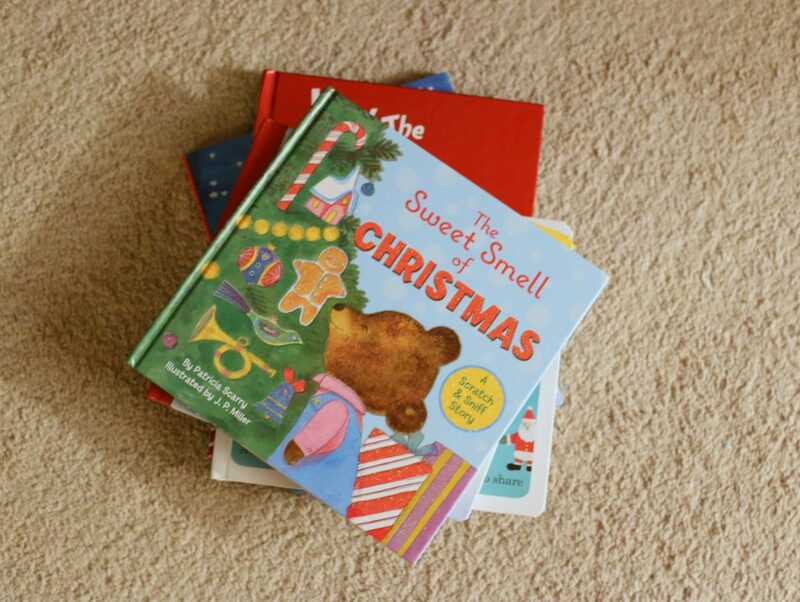 I had The Sweet Smell of Christmas as a child and my mom saved it, so now my kids read it. Of course, the scratch and sniff don’t work anymore, but it is still a sweet read. A really cute book is Santa’s Suit by Kate Lee. It is all about Santa trying to pick himself a new coat because he is tired of the red. Each page has a different coat that you can feel with different textures. We would bring out special books for each holiday for our children when they were little. So Valentines Day, Easter, 4th of July, Halloween, Thanksgiving and Christmas. We would add new books to our collection and we would all enjoy the basket of books for the month of that holiday. My children are now high schoolers but you brought back a very happy memory for me! Thank you! Have a wonderful weekend away! For ginger bread cookies check out shay shull mix and Match mama blog. Hey Julie! This recipe (from my high school boyfriend’s mom, ha!) is so yummy! They come out soft like sugar cookies and you can frost them as such, too! Thank you!! I used to read her blog a lot — I need to check it out again! Hi! You probably want a gingerbread cookie recipe to make gingerbread men, and I don’t have that. But, Martha Stewart’s Chewy Chocolate-Gingerbread cookies are literally my favorite holiday cookie! They are soft and just smell amazing. I’ll warn, they are really only good when they are fresh. They harden up after a day and are not good when they are hard. I like crispy cookies as well, but for some reason, these are really only good when fresh. We make a batch every Christmas Eve. I usually make the dough and refrigerate it, and just bake off as many as I think we will want to eat… so you could even make the dough and just bake a few whenever you want throughout the month. I HIGHLY recommend these! Have fun! Where is that table from (the white one) besides your new Fiddle Leaf? Would love a link if you have. Thanks! What color grey are your walls?! I love it! That’s the color of my living room too! Love it! 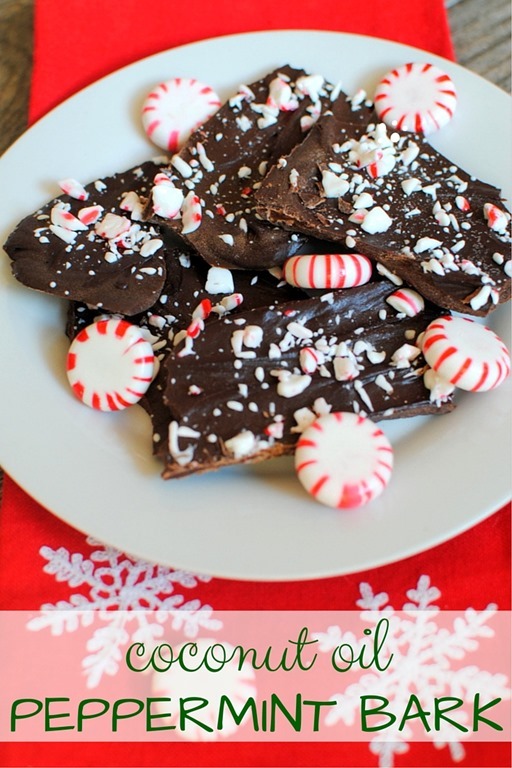 Thank you again for sharing the peppermint bark recipe! My one month old has a suspected milk protein allergy so I’ve been on the lookout for dairy free treats to make for the holidays! these look SO GOOD!!!! thanks for sharing! I swear to god that The Sweet Smells is Christmas pine smell and orange smell of my parents’ 30 year old book still smell!! Some kind of Christmas magic. I loved that book, along with Christmas Eve, by Sucie Stevenson. Just followed @nomoreshittybooks. Thanks for the rec! Every time I read, it looks like your boys just grow grow grow! That tree looks great! I’m all about fake plants in the house too…I’m not great with plants and flowers haha. Keeping a toddler alive…yes! But plants? no way! Hope you enjoy your staycation…can’t wait to hear about it! I’ll have to check out that Instagram account..always looking for a good read! This week having our Christmas decor up in the apartment is making me smile. Nothing cozier than Christmas lights! Hi Julie, I am a long time reader, from before you were even pregnant with Chase! I know from your blog, especially your posts about Thrive Market, that you are conscious about natural ingredients. Have you heard if Scout & Cellar yer? From food to household cleaners to makeup, we try to make healthy choices for our families and ourselves. I also happen to know from your blog that you enjoy a nice glass of vino. While we cut out chemicals and go organic for food and makeup and household items, have you ever thought about the chemicals and additives in your wine? Wine should naturally take 6-9 months to ferment. Mass produced wine ferments in 72 hours. How? The producers pour chemicals, additives and sugar into the barrels to speed production and increase profits. Scout & Cellar wanted to give you a chemical free option to enjoy your wine. Scout & Cellar is committed to an always changing inventory of clean crafted, chemical, sulfate and additive free wine. Clean crafted means less headache, less sugar, less calorie, and no chemicals. If you would like to check out how to add clean wine to your healthy repertoire, please contact me for more info at scoutandcellar.com/winejd. I can ship this delicious, organic wine directly to your home. Cheers! Sweet Smell of Christmas was one of my adult childrens’ favorite too! I am so glad it is still available for my hopefully future grandchildren!!! Ahh The Sweet Smell of Christmas! I had that book as a kid and now my son has it! It barely smells anymore and I want to order him a new one but I’m torn since I love the idea of him having mine! Thanks for sharing the book Instagram. Loving it so far! Huge thank you for recommending The Sweet Smell of Christmas! I had never heard of this book and my 2 year old is LOVING it! Thank you!!! So glad to hear it!!! One of our favs for sure! Did you plop the faux plant directly in the basket in it’s original planter or did you fill it with something? Totally getting the plant, thanks for the suggestion! And did you use the bigger or smaller basket? Thanks! The tree looks like real one in the photo. I like the sharing of the instagram account, I like reading, for sure it’ll help. Thanks so much for your post. It’s interesting to read your posting. Love your Christmas book collection, after read it I had an idea of buying some for my kids. Thanks for your sharing. Lovely list for friday. I bet you had great time with these things, sometime just simple but happy. Great sharing!